Responsive email design has been growing steadily in popularity. Some brands turn to responsive design techniques to create better experiences for their subscribers, and in many cases, increase their click and engagement rates. The foundation of responsive email design is built upon CSS3 media queries, which can be confusing and complicated to learn. And like everything else in email, they don’t work quite the same way in our inboxes as they do on the websites we view in browsers. 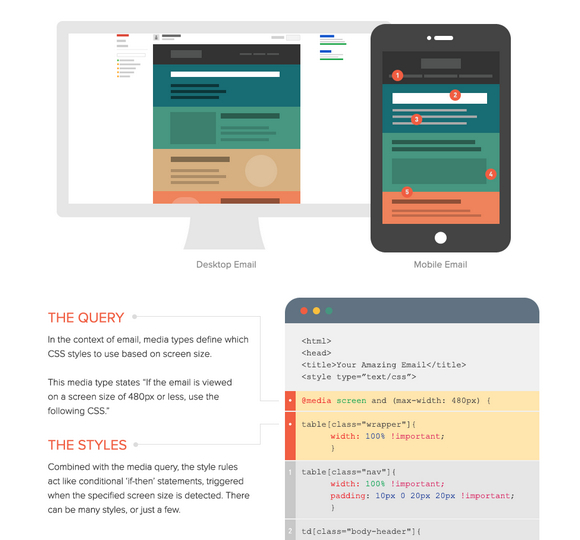 This is a how-to guide for responsive email design. See what is possible with responsive email design, how to implement media queries in your design, and support for responsive emails in various mobile email applications. Sad that it doesn’t support 9 out of 13 of the listed mailbox apps. Means just that you should not bother with responsive email, cause the changes possible are not worth it.